Before we are discussing the necessary steps for domain rename, you must ensure that you have a functioning and current Backup of your Active Directory infrastructure and Exchange and that you have a tested recovery plan in mind if domain rename fails. In our example we have a Windows 2003 domain named msexchange.org. Msexchange.org has the Windows Server 2003 forest functional level with Exchange 2003 SP1 installed. Due an merger we would like to rename the domain to Msexchange.com. 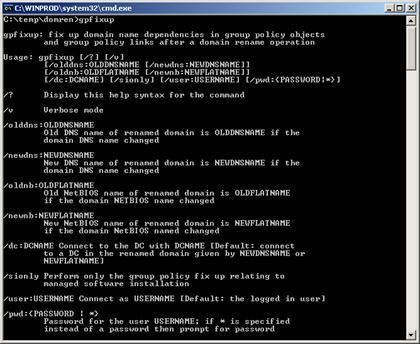 Rendom.exe is the command-line utility for renaming domains in Windows Server 2003 forests. Rendom is used to carry out the multiple steps in the domain rename procedure. You precede the domain rename process by using Rendom to prepare a list of domains in the forest. You begin the domain rename process by using Rendom to generate a script (Forest description file) that contains the instructions for renaming domains in the forest. You use Rendom again to verify that all DCs are adequately prepared (RENDOM /PREPARE) to make the necessary updates to rename the domains. Finally, you use Rendom to execute (RENDOM /EXECUTE) the actual domain rename instructions on every DC. Following the domain rename procedure, you use Rendom to remove all metadata written to the directory by the domain rename operation. The RENDOM.EXE tool from the web doesn’t work with Exchange installed. Use the version from the Windows 2003 CD. An updated version of RENDOM.EXE is suspected in the future. The installation of RENDOM is simple. As a result of the first command (RENDOM /LIST) you issue to begin the domain rename process, Rendom creates an XML file called the state file, which contains the list of all DCs in the forest. As DCs progress through the various steps in the procedure, Rendom updates the state file to track the state of each DC relative to the completion of the domain rename process. As you perform each step in the domain rename operation, Rendom automatically updates the state file. By monitoring the states of completion of each DC in the state file, you receive the information you need to issue the next Rendom command in the sequence. You can edit the state file to temporary exclude some DC for domain renaming procedure. The RENDOM /LIST command generates the current forest description and writes it to an output file (DOMAINLIST.XML) using an XML-encoded structure. 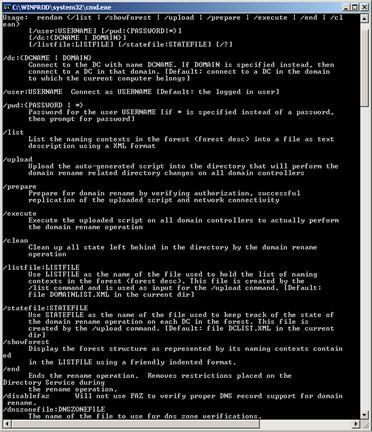 This file contains a list of all domains and application directory partitions in the forest, along with the corresponding DNS and NetBIOS names. Each domain and application directory partition is also identified by a globally unique identifier (GUID), which does not change with domain rename. To simplify specifying the new forest structure, Rendom gathers and compiles the current forest structure automatically such that the new forest structure can be overlaid on top of it. Simply replace the old ForestDNSZones and DomainDNSZones names with the new domain name. You can (but not must) change the NetBIOSName. For large organizations I recommend to use the search and replace function of your editor. When the DNS name of a domain changes, any references to Group Policy Objects (GPOs) within the renamed domain through Group Policy links (the gpLink attribute) on sites, domains, and organizational units is rendered invalid because they are based on the old domain name. Furthermore, the optional attribute gpcFileSysPath on a GPO that holds a uniform naming convention (UNC) path to a Group Policy templates folder located in the sysvol volume of the renamed domain will also be rendered invalid because the path uses the old domain DNS name. To correct the severed Group Policy links and the invalid UNC paths in GPOs within the renamed domain, you can use the Group Policy fix-up tool gpfixup.exe to refresh the Group Policy links and the UNC paths in GPOs based on the new domain name. The Group Policy fix-up tool should be run once for every renamed domain soon after the actual domain rename operation has been completed and before another domain rename operation is performed. The fix-up tool gpfixup refreshes all intradomain GPO references/links (that is, where the link and the target GPO are within the same domain) in the renamed domain. However, cross-domain references to GPOs in the renamed domain, where the link is in a different domain from the domain containing the GPO, will not be automatically rebuilt by this tool. For them to work, these cross-domain links will need to be repaired manually by deleting the old Group Policy links and re-establishing new links. It is not possible to explain every preparatory Step. For a detailed description see the domain rename Whitepaper. Rendom.exe tool versions before version 1.2 did not detect Exchange 2000 and incorrectly permitted domain rename operations. The actual version as I wrote this article was version 1.3. Important: To use this step by step Guide to rename Windows 2003 domains with Exchange 2003 installed, see the step by step guide later in this article. If your environment consists of NT4 Clients, you have to unjoin and rejoin every client from the domain because it is not possible with NT4 to automatically reflect the renamed domain. The domain rename tools can be used on all language versions of Windows Server 2003. There are no language-specific versions of the tools. Exchange Domain Rename Fix-Up (XDR-fixup.exe) fixes Exchange attributes after you rename a domain that contains Exchange 2003 servers. XDR-fixup is available as part of the Exchange 2003 Web Tools as a separate Download. Point your browser to http://www.microsoft.com/exchange/downloads/2003.asp. XDR-fixup is not a replacement of the Windows 2003 domain rename tools. The Windows Server 2003 domain rename tools were originally designed for renaming domains in Microsoft Active Directory directory service forests that do NOT contain Exchange 2000 or Exchange 5.5 servers. This limitation was because of renaming a domain affects several Exchange attributes, and there was no method for fixing these attributes. Microsoft Exchange Server 2003, however, is compatible with the Exchange Domain Rename Fix-Up tool (XDR-fixup.exe), which fixes Exchange attributes after a domain rename. 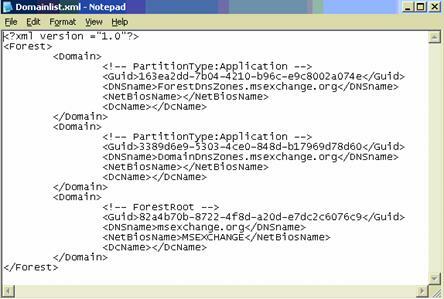 Domain rename is not supported in forests that contain Exchange 2000 or Exchange 5.5. Running the XDR-fixup tool is an additional step required for doing a domain rename operation. 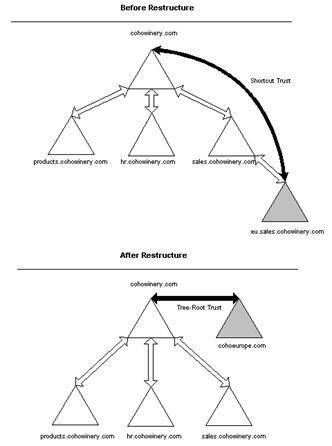 XDR-fixup modifies Exchange Active Directory attributes to reflect the new domain name. The XDR-fixup tool does not replace the Windows Server 2003 domain rename tools, nor does it extend the functionality of the domain rename tools. You must run XDR-fixup.exe every time you run RENDOM /EXECUTE. What does XDR-fixup NOT do? Domain rename doesn’t change any e-mail domain in Exchange doesn’t change any recipient policy. You must change your recipient policy after domain rename. You cannot rename the Exchange Organization with the domain rename tool. It is not possible with domain rename to merge two Exchange organizations into a single Exchange organization. The domain rename procedure requires enterprise administrative privileges to perform the steps in the procedure. The account you use must also have Full Exchange Administrator permissions. 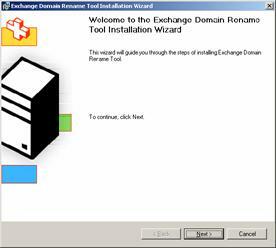 The domain rename tools are supported in Exchange 2003; all Exchange servers in the organization must be running Exchange 2003. The rendom.exe and XDR-fixup.exe tools are not supported in Exchange 2000 or Exchange 5.5. If the rendom.exe tool detects Exchange 2000 servers, the tool will not proceed. However, the tool will not detect whether Exchange 5.5 servers exist; do not attempt the operation if a domain contains Exchange 5.5 servers. If any SRS instance is running in the forest, you must remove it before the domain rename process begins. XDR-fixup installs all executables into the following directory: \Program files\Exchsrvr\Exchange Domain Rename Tools. The two steps between Step 8 and Step 9 are important for Exchange 2003 rename. It is not possible to explain every step in detail for this article. I will write a few lines to some step. For detailed information see the corresponding Whitepaper. Set up the control station. The control station must be a Member of the domain and a Windows 2003 Server. You have to install the Windows Server 2003 support tools and the ADMINPAK.MSI. “Install the RENDOM tool and the XDR-fixup on the control station. Re-establish external trusts. You must re-astablish every external trusts because it doesn’t reflect the NETBIOS name changes. The interdomain trust will be automatically fixed. Fix group policy objects and links (gpfixup.exe). GPFIXUP fixes GPO references to the renamed domain name. Wait for ALL domain controllers to reboot and replication to complete. Attention: Be sure that you specify the right credentials in the XDR-FIXUP command because the NETBIOS domain name might be changed. You can also specify the credentials in UPN format (username@domain.tld). Update Active Directory Connectors when you use the ADC for Interorganizsational restructuring (Please keep in mind that XDR-Fixup is not supported for Exchange 2000 / 5.5 – so when you use ADC for Exchange 5.5 migrations).